Per vincere è sufficiente scaricare l’applicazione Facebook Z ZEGNA FASHION CONTEST e diventare Z ZEGNA STYLE PHOTOGRAPHER. Martedì 18 gennaio alle 13.30 la sfilata Z Zegna F/W 2011 sarà trasmessa in streaming live sulla pagina Facebook Z Zegna. L’Album più votato vincerà un biglietto per la sfilata S/S 2012. Nowadays it is common to talk about fashion democratization linked to the fashion bloggers phenomenon. Z Zegna, as always at the forefront, goes beyond and invites you to the S/S 2011 fashion show, giving away a ticket for it. 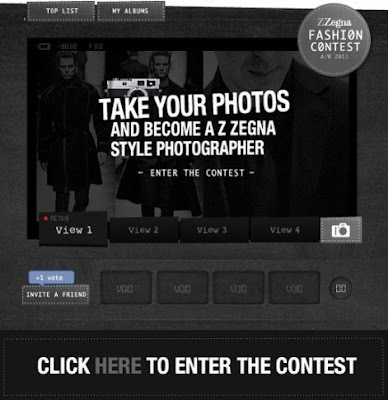 To win you simply have to download Z ZEGNA FASHION CONTEST Facebook application and become Z ZEGNA STYLE PHOTOGRAPHER. on Z Zegna Facebook page. The most voted album will win a ticket for S/S 2012 fashion show.